I went with my Nana to Franklin NC to visit a bed and breakfast. After a day of sightseeing, we wanted a nice dinner. Franklin does not have a lot of chain style restaurants, which was fine with me. Livingston Bar & Grill had a lot of delicious looking Caribbean items on the menu, including many vegetarian entrees. 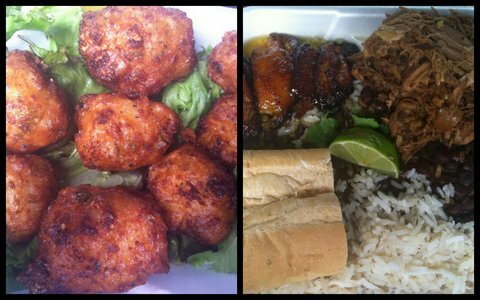 Nana and I decided on Conch Fritters with Key lime mustard sauce ($9) and Cuban Style Pork plate – mojo (pronounced mo-ho) marinated pork served over coconut rice, black beans and fried plantain ($18). The key lime mustard sauce flavors could have been more developed. The mix sounds good on paper, but did not come through when I tasted it. Fortunately for us, the conch fritters were delicious and did not need any dipping sauce. The batter for the fritters was lightly fried with conch chucks throughout. I was pleased since the last time I had fritters this good, I was in the Bahamas. Who knew I would be able to get conch fritters in the mountains of North Carolina? The Cuban style pork plate was enough for two people (this is why we shared a plate). I ordered this to-go and received heaping portions of rice with pork piled on top. There were several slices of sweet caramelized fried ripe plantain which balanced the salty, vinegary flavor of the pork. The coconut rice has bits of coconut in it, but it was not sweet to me. The black beans probably absorbed any possible sweetness in the rice. Overall, everything was very tasty. I would eat here again. I like their interpretation of Caribbean flavors and ingredient combinations. If you are in Franklin NC or just passing through, Livingston Bar & Grill is worth a visit.